“That perennial favorite historical conspiracy theory—who really wrote the plays we attribute to William Shakespeare?—forms the backdrop for Newton Frohlich’s rollicking good novel The Shakespeare Mask. The main character here—braggart, hero, ladies’ man, gallant, courtier, and secret artist – is young Edward de Vere, the 17th Earl of Oxford, who’s a headstrong noble at the court of Queen Elizabeth and one of her favorites and the more-or-less anonymous author of a series of compelling and hugely popular plays. 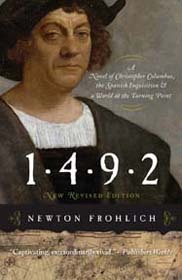 But in order to avoid the lower-class stigma attached to play writing, de Vere has to work anonymously and let another take the public credit—and in this case that person is a certain merchant from Stratford, a Will Shakespeare who’s hilariously portrayed by Frohlich as a canny, ham-handed moron. “Into this story Frohlich pulls all the points that have for so long made Oxford one of the leading candidates among the Shakespearean conspiracy theorists, all the uncanny correspondences his life had to incidents in Shakespeare’s plays. The Shakespeare Mask may win some converts to the Oxfordian case—and even the hold-outs will find it a hugely enjoyable read. 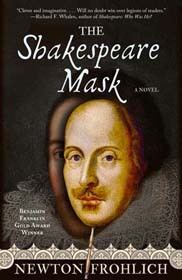 The Shakespeare Mask is available at your favorite neighborhood or online bookseller.